The professional services leader has the competitive moat and the growth to power your retirement account. Cognizant Technology Solutions (NASDAQ:CTSH) has been around for about 25 years, providing essential consulting services that help other companies compete more effectively in their industries. In the early 2000s, Cognizant experienced exponential growth as it helped companies navigate the disruptions being caused by the growth of the internet and e-commerce. 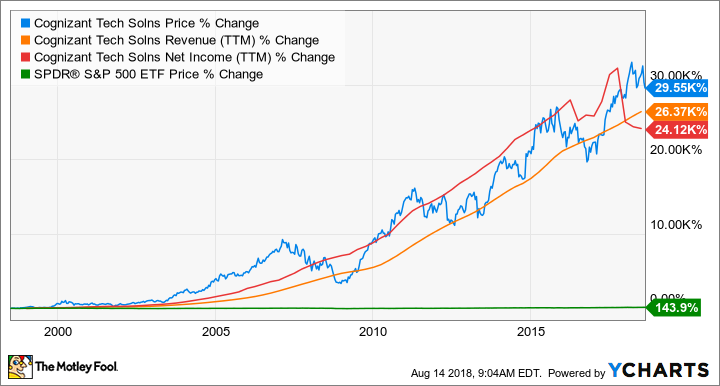 The stock has absolutely crushed the S&P 500 index since its initial public offering in the late 1990s, returning roughly 30,000% to shareholders. While it may not be the nimble upstart it was 20 years ago, Cognizant continues to see rising demand for its services, as companies are racing to adapt to the changes being wrought by the latest technologies, such as artificial intelligence (AI) and robotics, in addition to growth opportunities in mobile and cloud computing. As you can probably guess from the monstrous return on the stock cited above, Cognizant has been a growth machine. Between 2008 and 2017, revenue steadily grew at a compounded annual growth rate, or CAGR, of 20% per year, while net income expanded at a 19% annual rate. Those growth rates have fueled a 350% return for shareholders over the last decade. Companies continue to turn to Cognizant's team of highly skilled experts across various fields for help in different areas. Some are looking for better ways to reach customers on mobile platforms, while other companies seek solutions for reducing costs and streamlining operations. The number of customers Cognizant serves increased by 8.5% to 357 in 2017, and no single customer made up more than 10% of revenue last year. While total revenue growth has cooled down as it's grown larger, Cognizant is starting to see strong demand for digital services, which rose more than 20% in the second quarter of 2018 against the prior-year quarter. Digital services are nearing 30% of total revenue on an annualized basis. Large tech giants in Silicon Valley have turned to Cognizant for help in monitoring user data and managing their advertising operations. Cognizant has also seen increased demand from banks to set up more efficient ways to detect fraud using AI and machine learning. Overall, Cognizant saw a year-over-year increase of 9% in total revenue in the second quarter. Adjusted earnings per share grew 28% against the prior year. Faster growth on the bottom line resulted from management's implementation of a multifaceted plan to expand adjusted operating margin to 22% by 2019. This plan involves continued expansion of digital services, which carry a higher margin than the company average. Additionally, management is focused on reducing costs by simplifying overhead structure and reducing investment in less profitable services. The digitization of the global economy is creating faster cycles of innovation and change that makes Cognizant's services even more essential if companies want to keep up with their competitors and capitalize on new growth opportunities. This trend will not only create new clients for Cognizant but inevitably cause existing clients to use additional services. On the company's second-quarter conference call, Rajeev Mehta said, "Some of our large banking clients are spending more on new technologies to transform their businesses. And since our digital revenue with the banking segments is seeing strong growth, we believe we're increasing our share of that change the bank is spending." Mehta's comment about the greater share of spending from banks hints at the company's competitive advantage. Cognizant has developed very close relationships with clients, which are rooted in the high-quality service the company provides. As a client adds more services, the relationship gets stronger. This allows Cognizant to enjoy a fairly predictable revenue stream, since the client runs the risk of losing revenue and experiencing a significant disruption to its business if it were to stop using Cognizant's services. Despite Cognizant's high growth rates over the past few decades, the stock's forward P/E is currently 17 times management's 2018 adjusted earnings guidance of $4.50 per share. For a company with a strong economic moat and above-average growth potential, that valuation looks attractive. Cognizant also just initiated its first dividend last year as part of its plan to return $3.4 billion to shareholders by the end of 2018. The new dividend yields 1.05% at the time of this writing, which certainly sweetens the pot. Based on the above, Cognizant is a solid option for investors looking for a stable growth stock for the long term.